Join Robin Hood and his band of Merry Men on all their woodland adventures! 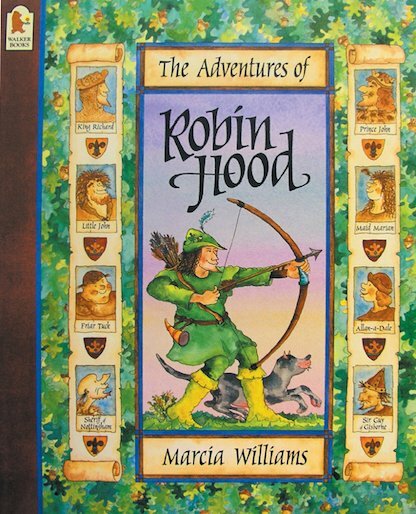 Find out how Robin became an outlaw, how he met Little John and Friar Tuck, and how he won the love of beautiful Maid Marian. And see how they battled the cruel and wicked Sheriff of Nottingham, bringing justice to the poor at last! Eleven classic Robin Hood adventures told in dazzling picture strips. I liked the part when Robin Hood blew the horn and his merry men came to rescue him. This book is really funny and the illstrations are superb. The Adventures of Robin Hood never get old even though we do, a timeless classic. A great fairy tale, love it and so would everyone else :)! Winner of the 2009 UKLA award for Archie’s War.